The early ICG Signature Series coins, such as this one, did not have a grade assigned. But all the coins are Mint State (uncirculated). The typical quality of these is above average (MS-65 or 66). 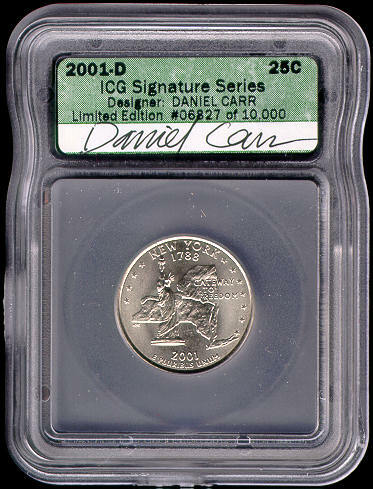 2001-D (Denver Mint) New York ICG Signature Series state quarter. Serial numbers on holders will vary. Although noted on the holder as an issue of 10,000, less than that were actually issued.